Kenyan Athlete: Three weeks to a marathon; is it better to be overtrained or undertrained? Three weeks to a marathon; is it better to be overtrained or undertrained? The last few weeks to a marathon race are the most confusing and difficult ones to deal with for many runners. You stop training; you gain weight. You continue training; you feel exhausted on race day. A successful race day depends more on how one balances their training at this stage in order to be in their best form at the right time. After all, if the results of a marathon simply depended on how much mileage one accumulated before the race, then all runners would be running over 100km in a single day. 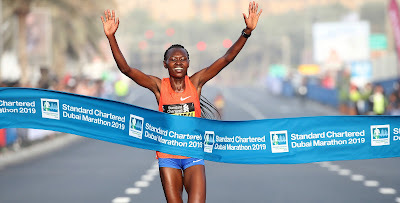 While training under Erick Kimaiyo, who currently trains the newly crowned Chicago Marathon champion, Brigid Kosgei; he usually separated athletes whose races were getting closer and gave them different workouts, or asked them to cover a shorter distance in our training. For example, if we were doing intervals of 1,000m twelve times, he would ask them to do eight. With three weeks to a marathon, often referred to as the tapering stage, some runners still feel they need to sharpen their fitness by adding a number of tempo runs into their training. Others feel they need to put in one or two more long runs before the race day. Others think it is time to go easy, relax and just wait for the race. There is actually little that can be done at this stage to change one’s fitness level. The only best thing one can do is to ensure that they keep themselves in good health while at the same time remaining active. Some coaches refer to this stage as “active recovery” where one should keep doing their usual morning runs, but relatively shorter and easier. Reducing one’s training by about 25% is what is agreed by many coaches as the best way to deal with this stage. Good runners should always use their workouts to get fitter rather than to gauge their fitness level, every day, against the clock and their training mates. Well, it may indicate to some extend their current level of fitness, but unpleasant surprises are bound to happen on race day as competing in training is not always a good indication of how one will perform on their races and will even hurt their performances. By over-training, one will most likely increase their chances of falling sick or getting injured before the race by unnecessarily pushing on hard with their training. During the race, they will also fail to perform to their best when what they had been lacking all along, a much needed recovery, suddenly becomes evident in the last stages of the marathon when they start to feel too light to maintain their target pace. They will watch helplessly as their training colleagues who could hardly beat them in their training runs will start to overtake them. By undertraining, one gets almost the same results, but with a lesser degree of disappointment since they will know that they struggled less in their training. Those who over-trained, perhaps, may as well get comforted by the fact that they will be transferring their mileage to their next race preparations. Both experiences will be great learning lessons for runners to prepare well for their next races. Tapering is a stage that requires little effort compared to the other stages of marathon training, but is as crucial as each of them if good results are to be expected on race day.